Floating storage and regasification units (FSRU) are in many cases the most economical way of adding storage and re-gasification capacity to the local gas supply. Depending on the size of the tanks, the load level of the liquefied natural gas (LNG), the ambient temperature and the quality of the LNG tank insulation the amount of boil-off gas (BOG) per hour changes. Fuel gas supply for auxiliary equipment such as dual-fuel engine gensets or gas combustion units. Minimum send-out (MSO) applications (minimum agreed amount of gas continuously fed into the gas distribution grid). Reciprocating compressor solutions offer the best in class gas control due to the insensitivity of this technology to dynamic suction/discharge pressure, mass flow changes and gas composition. 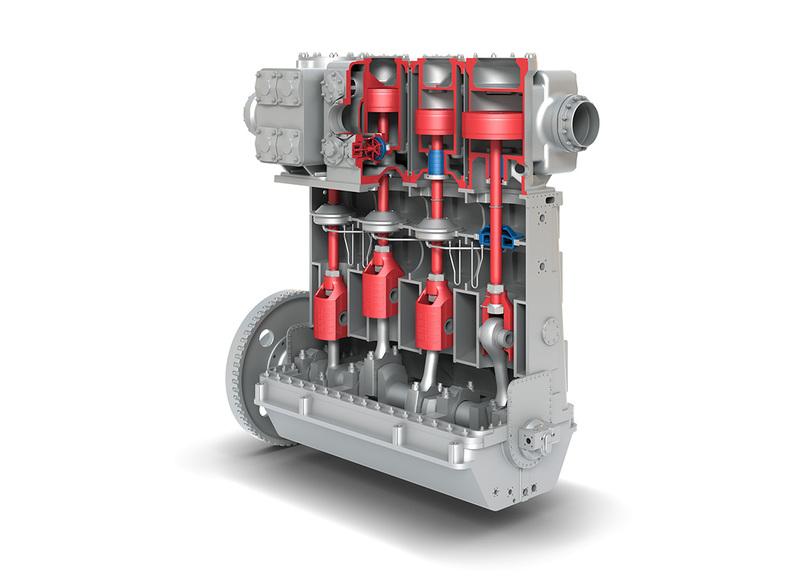 The Laby® Compressor solution for BOG handling on FSRUs on top of that maximizes the operational flexibility due to the use of temperature insensitive and contactless, oil-free labyrinth sealed pistons and piston rods, eliminating the need for gas pre-warming or compressor pre-cooling. Compressor vibrations are minimized to prevent damaging the LNG tank systems. Between the compressor stages, gas side streams to feed e.g. re-liquefaction, auxiliary engines or other processes allow multi-purpose compression and eliminate individual compressor equipment per process. The Laby® Compressor solution is designed gas tight to eliminate gas loss to the flare and N2 purging. Burckhardt Compression’s BOG handling solutions for FSRU’s help the owner to minimize operational expenses (OPEX) by eliminating major wear parts like piston rings and packings with the result of highest availability and longest mean time between overhauls (MTBO). Burckhardt Compression offers its compressor solutions as engineered packages. Our in-house competence includes compressor design and sizing, pulsation and vibration studies, plant engineering, instrumentation and PLC programming.